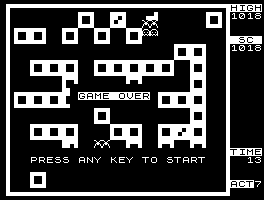 That's a great game from Scan-Bit. Pure machine language, and it works on both ROM version 1 AND 2. On the picture I've just been easten. You need joystick to play this game. Then use cursor keys, and 'U' for Fire. So this game is great. Just passed High-Score of 1000. It's a squish'em-game. Move next to a box, and fire to push the box towards your enemy. Clear all enemies to go to the next level. If the box cannot move you can pulverize the box by pushing it. Great random maze generator. It's all in just 7k. All Lambda 8300 programs ends with $FF. This must be the game Squeeze Play which cover was shown earlier. Now with the instructions there are more features than I just found. the monsters - the game is over. be given a number of points and an extra arrow. and you count from start. 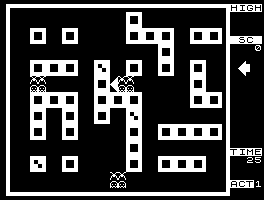 It is indeed Squeeze Play - I think this is the best game I have encountered for Lambda 8300 so far. Yes indeed. Very pleasantly surprised. Seems Scan-Bit Software released both great and poor games.